Will has done some epic bike trips with other graduate students in his program – notably his trip to China in 2013. He and a classmate named Ravi Bhoraskar had talked for some time about riding in the Indian Himalayas, but nothing ever came together. At Christmas 2014 Will said that Ravi was now working for Facebook and that he thought the trip would come together in the spring when Ravi needed to go back to India to apply for a new visa. He asked me if I want to come along and I jumped at the chance. The plan that emerged was to go in mid-May and to take a bus from Srinigar to Kargil and then to ride from Kargil to Leh. It sounded like a great trip but a little work on Google revealed that the pass between Kargil and Leh generally didn’t open that early. After some conversation Will and Ravi settled on a date at the end of July. This was a little bit of a problem for me in that I had won the lottery for a place in RAMROD on July 30, but it took no time at all for me to decide to withdraw from that event in favor of a ride in Ladakh. On July 23 (three days after returning from a week in Eastern Oregon) I flew from Seattle to Amsterdam and after a 5-hour layover flew on to Dehli where I met Will and Ravi and Ravi’s dad, Nitin (an E&T surgeon) at about 3:00 in the morning. Will had guided me through the process of getting an eTourist visa so customs was a short line and in minutes we were sitting in the domestic departures area waiting for the Air India counter to open. After checking baggage and getting repeatedly frisked and scanned we headed for the gate where they had recliners that we could couch out on for several hours. At about 6:00 we were frisked and scanned again and boarded a plane and flew to Leh. We spent the first day acclimatizing – meaning that we didn’t do much more than walk into town a couple of times to eat. Our guest house reminded me of Guatemala – obviously still under construction but with lots of DIY charm. The next day was another acclimatization day – a driver in a Toyota minivan took us on a tour of monasteries and temples and museums south of Leh. Both the mountains and the buildings were spectacular but my favorite was the museum at the new royal palace. We had lunch at a roadside place where the kids were playing with a monkey. For some reason we toured a school what was featured in a comedy movie… While we were out visiting monasteries somebody took our passports and applied for an inner-line permit for us so that we could enter the restricted area. The next day a different driver in the same minivan drove us up to Khardung La – a 18,000+ foot pass that bills itself as the highest motor-able pass in the world. Luckily I’d started my diamox before leaving Seattle. The road was paved for the first two-thirds of the way, but it was one lane wide and was basically one blind curve after another. The cars and trucks and motorcycles honked at the curves and when they wanted to overtake a slower driver, and there was a certain amount of intimidation involved in getting people to yield to you. Our driver was remarkably patient and seemed to know all of the local drivers. The next morning we visited yet another monastery (or rather we visited their stupa with its giant buddah statue and looked at the monastery from across the way.) 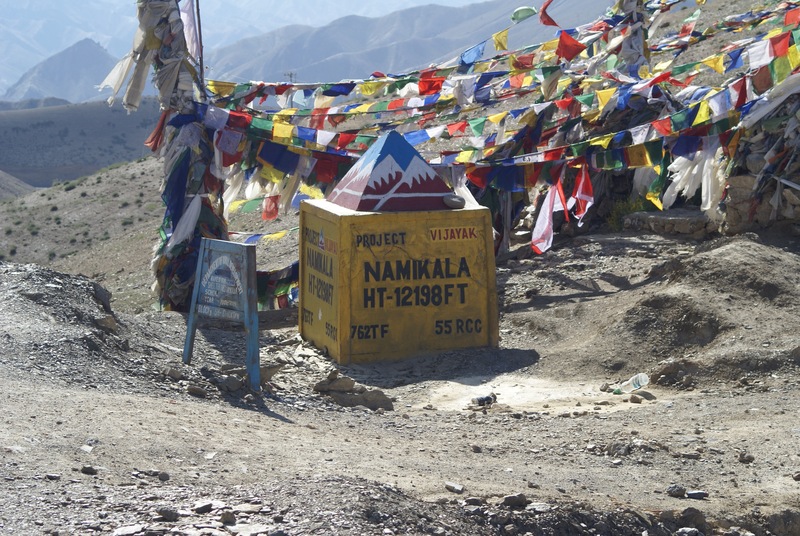 Then we drove back over Khardung La and returned to Leh mid-afternoon. We released the driver and headed to the bike rental place to pick up bikes for our ride. The bikes they had were in pretty bad shape – e.g. none of them would shift into the large chainring. After some dickering and threats to go to another shop the proprietor agreed that by 6:00 he would either have fixed his bikes so that they shifted or else would get working bikes from somewhere else. We walked around looking for another bike shop as a back-up plan and ended up in an internet cafe where we whiled away the rest of the day. At 6:00 the bikes were pretty functional and the shop gave us a floor pump, three inner tubes, a screwdriver and a couple of random allen wrenches. We ate at a Korean restaurant that evening. Nitin took Ravi’s pack until lunch and I took it afterwards – and I took it on myself to ride sweep, staying behind them even at a walking pace all afternoon. We had a good descent past the Liker cutoff and found ourselves at our planned destination of Saspul at 4:00 with a thunder storm threatening. We consulted with a couple of convenience store people who pointed us to the State Bank in the middle of town. The rest of the group took shelter in a prayer wheel enclosure while I rode through town to see what our guest house options might be. Far beyond the Bank I found a place advertising home stay, but the gates were closed. We eventually decided that there was only one potential place, a guest house that we had passed up when we entered the town. (We were told that the only other place was the home stay – but that the operators were in Leh for an event attended by the Dali Lama.) We headed back to the first place and couldn’t figure out how to raise anybody – until they came out of the fancy gate on the other end of the building. The place was called “Alchi View” – Alchi being a village across the river from Saspul. It had a fenced courtyard full of apricot and apple trees with a stable of cows in the back. There were two guest rooms on the second floor, the owners lived on the bottom floor, and the third floor was storage. The problem was that one of the two rooms was already occupied by a pair of british cyclists heading for Leh. Given that we hadn’t seen any other places to stay we decided that we could deal with all four of us in one room. The toilet was across the hall and of the squat variety. They offered us dinner, which was good since we hadn’t seen a restaurant. The third room on the second floor had a traditional Ladaki oven and lots of cookware – the food was great. We had breakfast there, too – Ladaki rotis and jam. The second day we had lunch in Khaltse – notable mainly for a bridge project that involved descending to the river on a dirt track and then climbing back up to the highway while jockeying with trucks and busses. It was dusty and hot and we were trying to find someplace with internet so that we could download google maps. We weren’t successful, but we found shops with posters of the Ayatollah, evidence that we were crossing a cultural divide out of the tibetan buddhist Leh. We climbed some switchbacks after Nurla which gave us an amazing view of an old monastery in the contact zone where red and grey rock intermixed. It was hot after lunch and we took it one switchback at a time. We crossed the Indus at Khalsi and the road became a narrower single lane with overhanging cliffs and a tributary river off to the side. It was also under construction and there were a lot of military convoys. We got to the start of the climb and took a long break – Ravi slept on the rocks. Eventually Ravi decided that he didn’t want to attempt the climb and chose to flag down a truck. Nitin wanted to stay with him until a truck was found, but wasn’t certain whether he would eventually ride or walk. Will and I soldiered on. The climb involved a lot of switchbacks to get out of a narrow canyon, but the grade was never very steep. The road surface didn’t improve and there were a lot of trucks. Just before Lamayuru, our 60KM destination for the night, we found Moonland – a set of golden mudflows. The town had a monastery on the ridge top. Ravi and Nitin were waiting for us when we got there, with rooms obtained in a really nice guest house. We had dinner in a roadside cafe and then showered and went looking for internet without success. The next morning we had breakfast in a garden cafe before resuming the climb. There were several stwitchbacks to get out of town, then a long twisty stretch on the highlands. We came to a small collection of buildings from which sheep and goats and their herders were emerging – and along with the buildings came the start of the climb to the pass. We proceeded one switchback at a time until we finally attained Fotu La – at over 13,000 the highpoint on the road between Leh and Kargil. We rested and looked at yaks and sheep and a pack train. Then we had a good descent all the way to Hennis and Budkharbu. Unfortunately my rear wheel locked up as we were climbing into Budkharbu and I ended up carrying the bike for a couple of KM. We eventually found a man with tools and I was able to loosen the locknut that had caused the problem – but I knew that something was going on with the bearings and I didn’t have any way to get at that. We passed up the Army cafe, looking for something less commercial, and ended up outside of town with no lunch place in sight. We stopped to talk to two women, a child and a cow and learned that there was no place for lunch or to spend a night before Mulbekh, 10KM on the other side of the next pass. We didn’t actually believe this because the maps we’d seen showed villages every 10KM along the way. After some discussion, one of the women, the child and the cow all left and we continued to argue with the other woman until she volunteered to make lunch for us at her place. We accepted enthusiastically and then went into her basement and waited until the food was ready. After lunch it was almost 3:00 and we realized that we were not going to climb to the pass that afternoon. Our strategy became one of simply finding the first place available to spend a night – which involved accosting random strangers and asking them if they knew of any in the area where we could sleep. Various people had various answers, but the trend seemed to be that there used to be a hotel in Khangral. A guy on a motorcycle told us that people used to stay at the police checkpoint so we stopped there and they pointed us to the official building across the street. The guy in charge there was afraid he’d get into trouble if he let us in so that option proved to be a dead end. We continued to the next collection of mud-brick buildings and the people in one convenience store pointed us to the next one – where they pointed us to the tea stall next door. The tea stall was about 20 X 12 with two long tables and a cooking area. We stuffed the bikes in the stairway that took up one end of the room and the proprietor spread out carpets next to the tables for us to sleep on. It was too early for bed so we agreed that he would cook us Maggi for dinner at 6:30 (there being no restaurant in town) and we went out to watch street cricket. After dinner we cleaned up at the “safe” water tap, plugged in our electronics, and then crawled under blankets. The tea stall evidently served as a community gathering place, though, and that didn’t stop just because four outsiders were bedded down in the back. The proprietor and his helper finally turned off the lights and left at 9:00. I got up early and took a walk and some photos. We started climbing right out of town although it was a few kilometers before we got into switchbacks. The climb to Namik La wasn’t as strenuous as the one to Fotu La, but it was another effort we took one switchback at a time. There were a lot of herds of sheep and goats and they climbed faster than we did. After the pass we had a 50KM descent to Kargil. We confused the little town of Wadoo with Mulbekh – the restaurants in the former were more interesting but it was too early for lunch. Mulbekh had a giant buddah carved into a cliff and a lot of guest houses. Will took a selfie with a guy on a motorcycle. After Mulbekh the road was less steep and ran along the river. It was also in worse shape with frequent unpaved patches. About 20K outside of Kirgil we came on a long construction zone where there was heavy equipment in use (in contrast to the regular Ladahki manual labor teams.) We were stopping to regroup every couple kilometers at that point but it was so dusty and the gravel, trucks and bulldozers required such concentration, that we stretched those segments. As we started up again after the third or fourth regrouping, my rear wheel got very hard to spin and as I stepped on the pedal to get over to the side of the road the end of the quick-release skewer snapped off. I yelled at Ravi to go tell Nitin and Will what was up and after repositioning my wheel I started walking and pushing the bike. It turned out that I was about 1 KM from the resumption of the pavement and a dozen KM from Kargil. Once we were all back together we realized that we had no option but to flag down a ride. Ravi volunteered to accompany the broken bike so that I could ride his. We found a minivan right away and agreed to look for Ravi at the central market. There was a short climb out of one gorge and then a descent into another – that being the Suru river and Kargil. We headed for the market, found Ravi, and then inquired into hotels until we found one with wifi. After checking into the hotel we went to a small restaurant for lunch and then hung out on wifi while it rained. We finally gave up on the weather and walked around town in the rain until time for dinner – we ate at one of the hotels we’d rejected earlier. The guest house proprietor from Leh came by at about 10:00 that evening and picked up the broken bike. Will and I got up early and walked around town some more before breakfast. Kargil is very different from Leh in that there are few souvenir shops and no visible presence of foreigners. There are a bunch of mosques but no obvious buddhist temples. We saw Khomeini Square and the offices of the Khomeini Trust. There seems to be a pretty sizable military presence, but the main street level activity seems to be carpenter shops, steel fabrication, tailor shops, and similar quotidian pursuits. The general stores are generally much better stocked than what we saw in Leh or on the highway and the central market is big and active. There is a big hospital and an impressive number of clinics, labs, physicians, and various support services. We called the taxi and had him come earlier than planned. We tied the remaining three bikes on the roof and took off for Leh. Back in Khangral we ran into traffic and found our way blocked by a religious procession. When the cops finally let us squeeze by we saw young men in formation, without shirts, at least some of whom had chain flails. We had lunch in Khaltse again and stopped at “magnetic hill” for Nitin to take pictures. We got back to Leh in the late afternoon and checked into an adjoining guesthouse as our preferred one was full. Nitin and Ravi dealt with the bike rental place (compromising on paying the rental fee but nothing for repairs) and then we went into town, walked around a lot looking for string and contact lens cases, and ate at a pizza place. Unfortunately an apricot I’d been persuaded to eat on the ride back caught up with me at dinner time and I wasn’t able to make it back to the hotel without soiling my shorts. I rinsed laundry and spent most of the night visiting the toilet. The taxi collected us at 6:00 and took us to the airport for security scans and a flight to Jammu. We had a long layover there and then went through security again for a flight to Dehli. Dehli was hot and humid and the driver the hotel sent to collect us couldn’t figure out where we were. We finally took a radio cab for the 10-minute ride to the hotel and gorged on internet and clean bathrooms. We went out to dinner late that evening, heading for the Radison and their prix-fixe buffet. I did not trust my bowels and tried not to eat. I almost made it through the meal before I had to excuse myself and run across the lobby searching for a restroom. The next day Ravi needed to submit documents for his visa/greencard so we took an Uber across town to a coffee shop near the American administrative compound. We hung out there for several hours while Ravi completed the forms. At his urging we went to Pizza Hut for lunch and then walked to the Lotus Temple that Will identified on Google as the only attraction near our coffee shop. Turns out that it was a Bahai Faith worship place – unexpected but fascinating. Then we walked back to Starbucks and Will and I waited for a couple of hours while Ravi and Nitin found a place to get a passport photo taken. Ravi wanted buttered chicken and none of the top-10 places on the internet were close by, so we asked the Starbucks barista and got a recommendation for a place three metro stops away. We rode the subway and then walked in all four cardinal directions without seeing anything that looked like a restaurant. After trying unsuccessfully to get a cab we got back on the subway and went downtown where we connected with the airport express back out to our hotel. There was a hotel on the same block as ours with a restaurant that was empty but actually pretty good – and their buttered chicken hit the spot. After dinner I gave Will my Indian currency and then headed for the airport where I had more security adventures (they need a printed ticket to let you into the terminal and they want 30R to print it for you) but eventually made it onto a 3:15AM flight to Amsterdam. I found myself in a window seat in the rear of the plane for an 8-hour flight. The aisle seat was occupied by an obese woman who arrived by wheelchair and who couldn’t or wouldn’t move to let me out when I needed to find the toilet. Before I got done I was claustrophobic, sweaty, and my heart was beating faster than on any of the passes we’d climbed. The KLM stewardess took pity on me and let me sit in a jumpseat in the galley for five or six hours. I had a relatively short layover in Amsterdam and then had another 8-hour flight to Minneapolis on Delta. This one was better and the touchscreen on the seatback had a USB socket so that I could recharge. 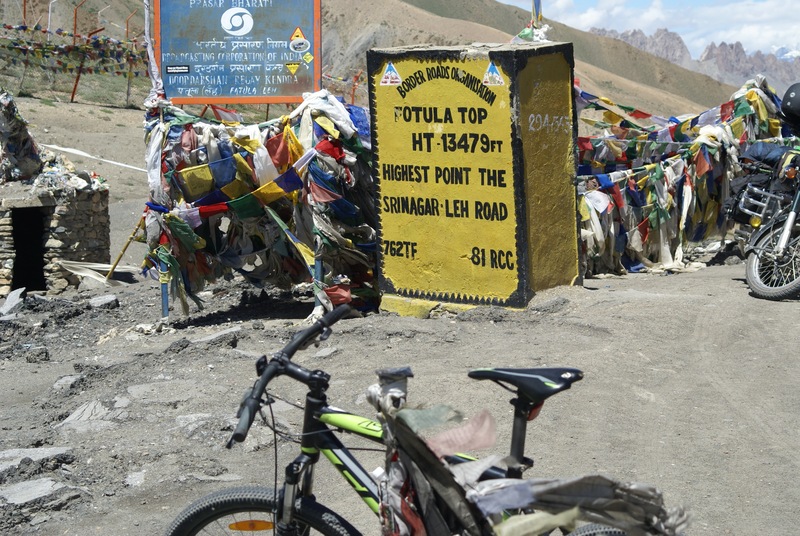 I cleared customs at the automated kiosk in Minneapolis – I had checked a duffel with Will’s two $15 carpets – but the only question they asked was why I had chosen Ladakh for mountain biking instead of going to the U.P. The final leg of the trip was an Alaskan Airlines flight to Seattle. I had a beer and slept most of the way. Alaska couldn’t find the duffel when I arrived – it showed up mid-day the next day evidently having been put on the wrong Delta flight. Besides the carpets it was full of the laundry I’d rinsed out in Leh so I wasn’t all that anxious to track it down. 8/1 – Day 4: 39 miles – here’s the map. 7/31 – Day 3: 28 miles- here’s the map. 7/30 – Day 2: 38 miles – here’s the map. 7/29 – Day 1: 39 miles – here’s the map.